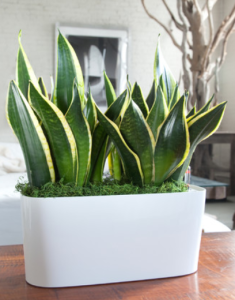 Houseplants are like good friends…..
Spring’s here and I am excited! I love getting outside and implementing all the plans that have been running through my head during the dormancy of winter. I also love doing what I can to bring the outside IN. I have never claimed to have a green thumb, especially when it comes to indoor plants. I love them, but I want something that is LOOOWWWWW maintenance. A good houseplant is like a good friend. They are there for you but don’t require a ton! Here are 5 houseplants that you probably won’t kill. I hate it when someone tells me that, because it REALLY hurts my self-esteem when I manage to kill the un-killable. A plant I love and have not killed in two years is the Snake Plant (another variety is Mother-in-law’s Tongue, which has a yellowish border on the leaves). This plant is in the succulent family and only needs to be watered about once a month; my kind of plant! The soil should be allowed to dry somewhat before watering. Being a succulent, it retains much of its water. 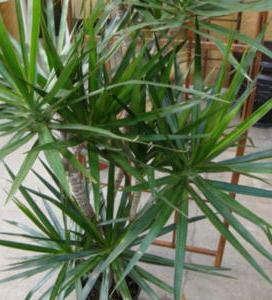 It is a striking plant and can be re-potted easily. Bright light to low light, it adapts…sweet thing! A little more persnickety, but still a pretty nice little plant ~ the Philodendron ~ It is a very easy-to-care-for plant. 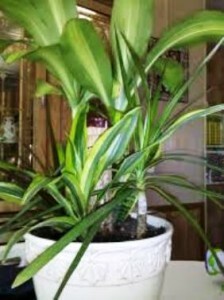 It does well in low to medium light (ummm…even some bright indirect light) and needs to be watered about once a week. Water it well and let the soil drain, but never let the soil dry out completely. Always test the soil with your finger. If the soil feels dry down by the roots, then you probably want to water it again. If it feels moist, then you can let it go and then check it again in a couple of days. You will have to water it less during the cold months. 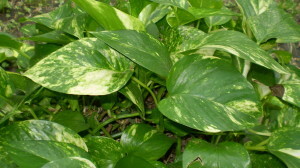 It comes in dark green or a beautiful variegated green and white-ish. The Corn Tree~it looks exactly how it sounds, a big ole’ stock of corn, but wider with rounder leaves. Very tropical looking with a canopy type growth habit. Again, a low maintenance friend. Water it well about once every two weeks. Soak it well and allow the soil to drain. This is not a small plant. Give it the space it needs and it could be a great FOCAL POINT. Marginatas are very exotic-looking, and easy as pie to care for. And simply a very cool tree-ish looking plant. They like moderate to bright indirect light. They can do well in a low light room away from a window. SO EASY! Don’t you love it? They do not like to be overwatered. Their leaves will start to turn yellow and they will fall off. Always makes sure you do not overwater your tropicals. Again, just keep the soil moist, not soaking wet, not too dry. Wouldn’t you think it would be just the opposite? When I think of tropical, I think of wet! 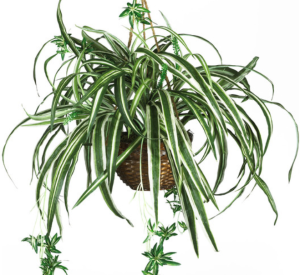 And one of my all-time favorites, the Spider Plant! 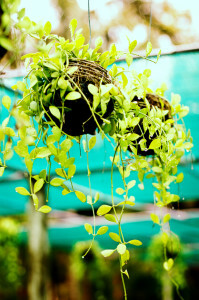 I love this hanging beauty with it’s sweet little babies dangling from the stems like miniature parachutists. I have found these to LOVE hanging by a window with a lot of indirect light. They come in grass-green or a beautiful variegated green, light green, white-ish leaf. Water once a week or when the soil is dry to the touch. They also love to be under-potted to produce more of the little plantlets. Enjoying the outside inside ~ all year round! These plants can be especially nice for a basement.